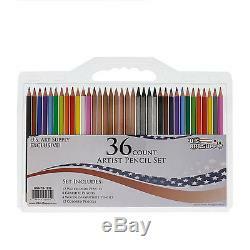 Art Supply 36 Count Professional Hi-Quality Artist Colored Pencil Set with 12 Watercolor, 8 Graphite, 12 Colored & 4 Woodless Pencils. FREE Reusable Plastic Carry Case. Premium Pencils that are produced with carefully selected high-quality pigments. Soft leads create a smooth color laydown for superior blending and shading. Thick, long-lasting color cores resist breakage and bring bold statements to life. Vivid and intense in one stroke and subtle and soft in the next, they are perfect for any project. 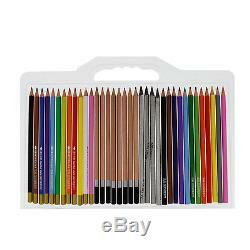 Pencils are equally capable of producing quick sketches or finely worked drawings. Great for Drawing Manga Art and works well with all Drawing Media.